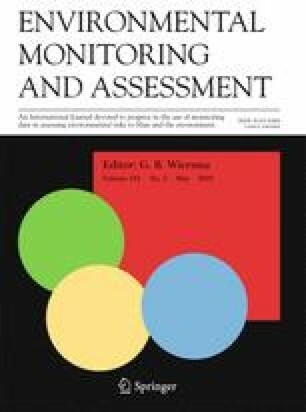 The aims of this study were to investigate the occurrence and distribution of total mercury (Hg) and other trace elements of environmental concern, such as arsenic (As), copper (Cu), chromium (Cr), manganese (Mn), nickel (Ni), lead (Pb), zinc (Zn) and vanadium (V), in soils from the abandoned Merník cinnabar mine in eastern Slovakia. For this purpose, thirty soil samples from two depth intervals within the mine area (n = 60 soil samples) and additional sixteen soil samples from adjacent areas (n = 25 soil samples) were collected. Total Hg was measured by atomic absorption spectrometry, while As and other metals were analyzed using inductively coupled plasma atomic emission spectrometry. High mercury concentrations (> 100 mg/kg with a maximum of 951 mg/kg) were observed only in surface soils close to mine waste heaps and adits. Otherwise, Hg concentrations in the majority of surface soils were lower (0.14–19.7 mg/kg), however, higher than Hg in soils collected from sites outside the mine area (0.19–6.92 mg/kg) and even considerably higher than Hg in soils at sites not influenced by the Merník mine. Elevated Cr and Ni concentrations in soils regardless of their sampling sites (mean of 276 mg/kg and median of 132 mg/kg for Cr and 168 mg/kg and 81 mg/kg for Ni, respectively) were attributed to the lithology of the area; the soils are underlain by the sediments of the Central Carpathian Palaeogene, containing a detritus of ultrabasic rocks. As our geochemical data are compositional in nature, they were further treated by compositional data analysis (CoDA). Robust principal component analysis (RPCA) applied on centred (clr) log-ratio-transformed data and correlation analysis of compositional parts based on symmetric balances distinguished very well different sources of origin for the chemical elements. The following three element associations were identified: Hg association with the main source in mining/roasting, Cr–Ni association derived from bedrock and As–Cu–Mn–Pb–Zn–V association (natural background and minor sulphides/sulfosalts in mineralized rocks). The values of geoaccumulation index and enrichment factor suggested that concentrations of Hg in the soils were influenced by human industrial activities. The online version of this article ( https://doi.org/10.1007/s10661-019-7391-6) contains supplementary material, which is available to authorized users. This study was financially supported by the Scientific Grant Agency (VEGA) under the project No. 1/0597/17. Comenius University Grant No. UK/247/2018 is greatly acknowledged for financial support of the present study. We would like to thank two reviewers for their valuable comments that helped to improve the scientific level of this manuscript. Anon (2015). Guideline of Ministry of Environment of the Slovak Republic No. 1/2015–7 for the elaboration of risk assessment analysis of contaminated sites. http://www.minzp.sk/files/sekcia-geologie-prirodnych-zdrojov/ar_smernica_final.pdf. Accessed 27 June 2018. (in Slovak).